Set up a barbell with desired weight on the floor in front of you. Check to make sure the floor isn't wet (from perspiration or spilt water). From a standing position face the barbell with feet moderately apart (not usually more than shoulder with, but still wide enough to maintain balance) and squat down by bending the knees until you are low enough the grasp the barbell. Grasp the barbell with an overhand or overhand underhand grip that is slightly wider than shoulder width (if desired, you may experiment within a few inches of either direction, narrower or wider, to see if one grip is more comfortable). 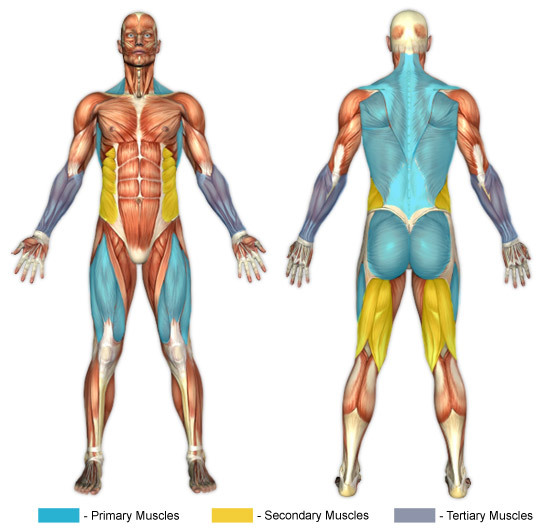 Inhale deeply, contact the abdominals and lower back muscles to create a block (an explanation for doing so is under "further clarification"), and, to the greatest extent possible, use your legs to lift the weight upwards until you are standing upright. The bar will pass right in front of your shins, but ideally it shouldn't do any more than lightly touch them, if that. It's when the bar reaches your knees that you will begin to right your torso. Pause briefly at the top of the motion to assure that optimal contraction is achieved. Do not lock your knees - stop just short of doing so. Carefully lower the weight back to the starting position and once it has reached there, exhale. Deadlifts are part of the power-lifting triumvirate; that is, they are one of three exercises that power-lifters do in competition. If you aren't using wrist straps (wrist straps are fabric straps that allow for heavier lifting by reducing stress put on the fingers and forearms) but still want to keep your grip when lifting a heavier weight, you can alternate your grip (using an, aptly titled, "alternate grip" or "reverse power grip") so that one hand is overhand (palm facing you) and one is underhand (palm facing away). This grip method can also be used in conjunction with wrist straps to further increase the amount of weight that can be held. It's effective for primarily two reasons: one is that it keeps the bar from rolling and the other is that it aids the thumbs in keeping their grip better. The latter reason is explained by the fact that with both hands in an overhand grip there are 8 fingers on one side of the bar and only the 2 thumbs remaining on the other. Whereas, with one hand in an overhand grip and the other in an underhand grip there are 5 fingers on each side of the bar. Thus, the thumbs have help. The bar cannot be gripped too hard. The better your grip is the more power and control you will feel. Not to mention, a good grip is conducive to being able to focus on lift form and the muscles involved. To the greatest degree possible, the power to deadlift the weight should be generated from the quads and glutes. This is not to say that the lower back will not become involved in the lift because it most definitely will. The greater the weight that one attempts the more involvement the lumbars will likely have. Notice that proper breathing for this exercise is different than many others. The inhaled breath is held, while at the same time contracting the abdominal muscles (and lower back muscles, if possible - many people find conscious contraction of these muscles difficult), so that a body "block" is created. Below is a description of how to achieve a "block". Contract the abdominal muscles throughout the effort. The increased intra-abdominal pressure enhances core support by essentially preventing the torso from collapsing forward. Contract the lumbar (lower back) muscles. This keeps a slight arch in the lower back. The point is to keep the spinal column in extension. Deadlifts offer some of the greatest overall benefits of any exercise, but also pose some of the greatest risks. It is almost guaranteed that if proper form is broken, injury will eventually result. Form, as always, will allow for safe lifting of even very heavy weights. As described in the 'further clarification' above, "blocking" will greatly aid in keeping proper form. The idea is to keep the back straight. Do not round the back.